The Museum is closed for the 2018 season. Thanks to all our visitors in 2018 and looking forward to seeing you in 2019! October 12th & 13th Columbus Day last days of 2019 season. Our Mission and Vision Statement: To preserve the rich cultural heritage of forestry and conservation in the State of Maine so that it may be shared with generations to come; to educate about the contributions of logging, logging families, and the forestry industry; to instill appreciation for the natural resources of the Maine forest; and to inspire visitors to support this cultural preservation and encourage others to join in the effort. We welcome large groups and bus tours! To schedule a museum presentation and a special time for your group visit, please contact us to make arrangements. Special rates apply for group tours. JULY 25 & 26, 2014. Maine Forestry Museum memberships are a great way to support the Museum! Benefits include a 10% discount at the gift shop, 10% off vendor booths, and free entry for your family and friends into the Museum by showing your membership card. 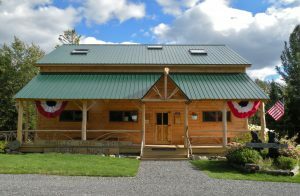 Maine Forestry Museum is a non-profit, 501(c)(3) organization. Your donation helps us to keep our doors open to share this vital history of the Maine woods with every visitor that comes through our doors! Click here to view a great short video of the Rangeley Region created by "The Activities Guide to Maine" Magazine during the summer/fall of 2013.